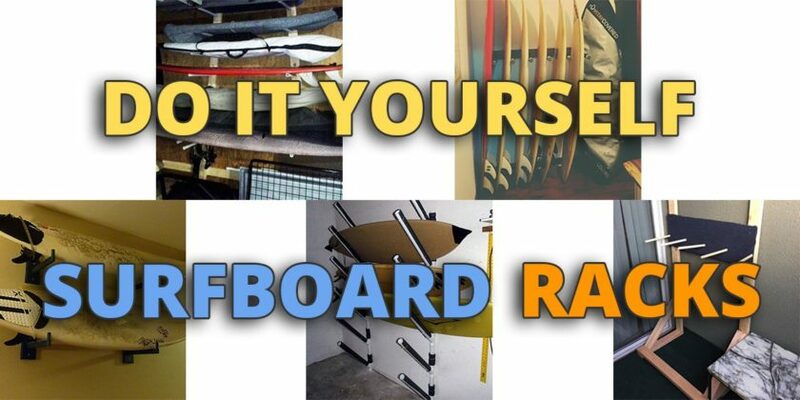 Listed below are the best DIY surfboard racks that you can build. Construction for all of these surf racks is quite straightforward, it’ll save you money and they’re a fun little side project for you to work on at the weekend. 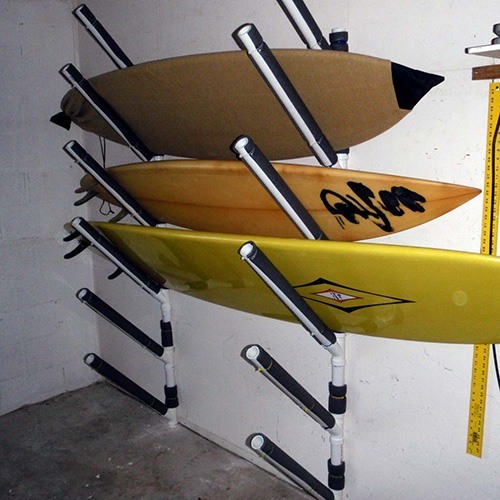 Wall mounted surf racks are the most popular because they are the easiest to create. All that’s really needed is a wood plank and wooden rods. When building a wall mounted rack indoors, it’s good idea to have some carpet or floor protection for when water drips off the board. 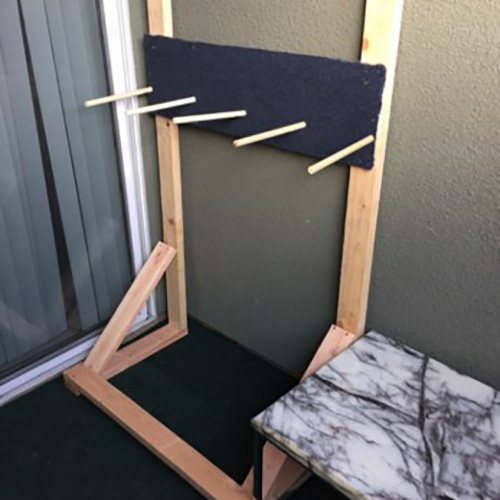 From Surf Sufficient, this video guide on building a wall mounted surfboard rack is straight forward to set up and uses bamboo, wooden boards, carpet and glue. Cut the bamboo using the hand saw. Take the piece of bamboo and place it on the bottom plant of wood and mark around it with a pencil for drilling. Drill a hole into the marks on the bottom piece of wood using a 1 1/8″ paddle bit. Repeat this x4 times equally spaced over the board. Drill all the way through to the other side. Wrap the end of the bamboo pieces with masking tape. Add the wood glue onto the tape. Then insert the bamboo into the holes you just created. Ensure they don’t stick out through the other side. Repeat this step x4 times. Optional step: Use the wood stain on your wood. Hold the wood against the wall where you’re going to mount the rack. Screw in the wood to wall using the 3″ screws with a screwdriver or drill. Place some carpet beneath the wall mounted surf rack to protect the tails of your surfboards. Similar to the video above, this guide from Tidal Push has more detailed written instructions, plus it provides some good pictures and measurements. A good in depth guide from Instructables. 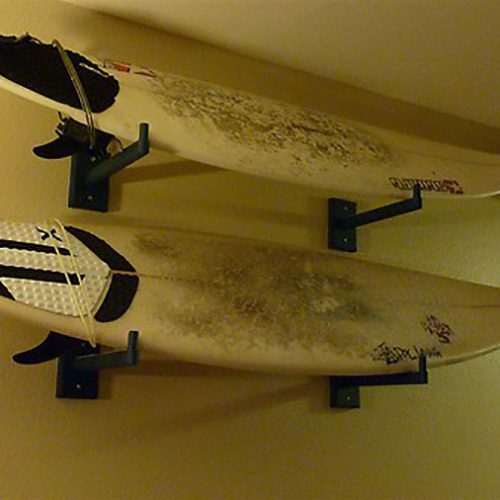 Great if you’re looking for a horizontal, wall mounted surfboard rack instead of a vertical. This guide from Tall Guy Surfing is another horizontal wall mounted surf rack, but this one’s made mostly out of PVC pipe. More of a “surfboard display” than a rack, this creation from Johnny Side Burns is quite minimalist when compared to the other wall mounts. 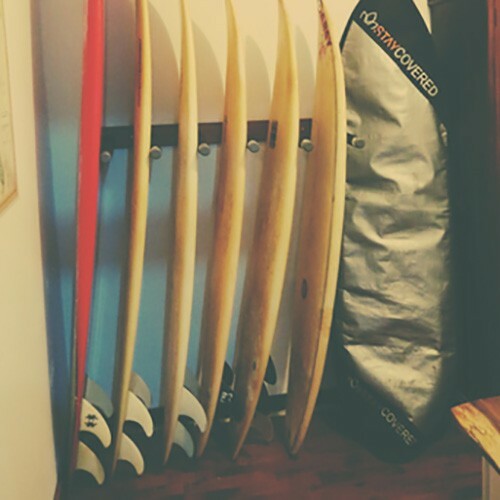 Whilst a freestanding surfboard rack might be more difficult to construct when compared to a wall mounted one, it does have some advantages. Firstly, you’re not damaging the wall so if it ever gets removed you won’t have to do extra maintenance work. Secondly, because it’s free standing, you can easily move it around your room or house and into a new location if you change your mind. Inertia provides this straightforward guide to setting up a freestanding rack on a budget. 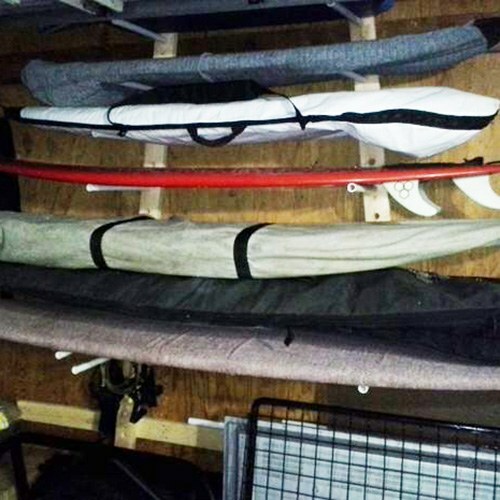 Ceiling surfboard racks are simple to make and save loads of floor space. However, their main drawback is that they you have to keep an eye on the amount of weight they can carry. Good for garages, this ceiling surf rack from Surf Sufficient is very cheap to make. Measure your ceiling space to make sure there’s room. Use the pliers to screw the eye bolts in to the ceiling joists. Attach the carabiners to the eye bolts. Tie a knot using the rope into the carabiners. Adjust both ropes so they are the same length and there is enough space. Test for strength and add additional eye bolts if necessary. Hang your surfboard in your new ceiling rack. Out of all the racks listed here, the bicycle surfboard rack is the hardest to construct. However, it’s also the most useful if you are within cycling distance to the beach. 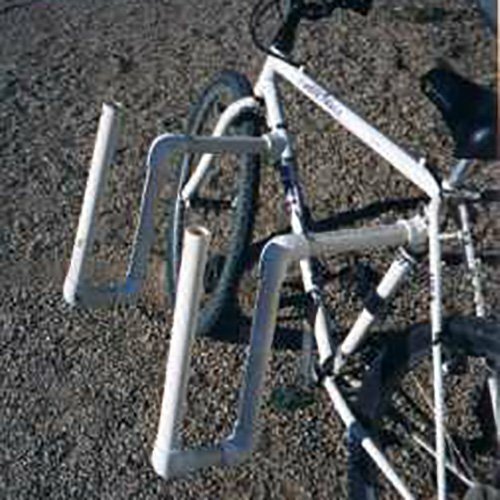 This PVC bicycle surf rack from Surf Sufficient is lightweight but also strong enough to carry a surfboard. Measure the diameter of your bicycle frame. Take the hacksaw and cut the PVC T-Joint to match the diameter of the bicycle frame. Use the sandpaper to smooth down the edges. Place the T-Joint onto the bicycle frame and insert some PVC pipe into the T-Joint. Mark on the PVC pipe 1″ further along than where the outside of your pedal will be. Cut x2 pieces of PVC pipe at this length. Fasten the T-Joints to the bicycle using the hose clamps. Make sure both joints are aligned to the same height with one another. Insert the x2 cut pieces of PVC pipe into the T-Joints. Add x2 90 degree joints to the ends of the PVC pipes your just inserted. Angle the joints downwards. Measure and cut out 2 short pieces of schedule 40 PVC pipe that are a couple of inches long. Add these to the downward facing 90 degree joints. Then also insert a T-Joint that is inward facing to the ends of both of these. Measure the gap between the 2 T-joints you have just inserted. Cut the schedule 40 PVC pipe to the appropriate length to match these x2 joints. Insert this PVC pipe between the 2 T-joints. This will give you a frame between the 2 PVC arms. Get on your bicycle and give your pedals a small swing around. Check that you have plenty of space to give your feet a full revolution of the pedals. Continue adding pipe facing downwards from the central frame you have just created. Then at the bottom, place x2 90 degree joints facing outwards. Measure and cut x2 pieces of the schedule 40 PVC pipe so that you have enough width to hold your surfboard. At the end of these pieces of pipe, add an additional 90 degree joint facing upwards. Measure x2 pieces of PVC pip facing vertically upwards to be the outside pipes for the frame – ensure they’re the same size. Optional: Finish these off with x2 final 90 degree joints that are facing one another inwards. Measure and cut a final piece of pipe to fit between these 2 joints. With the frame now all fitted together, take a pencil and mark on every joint/piece of pipe that is connected to one another. This is so when you glue everything together in the next step, all of the pieces will be correctly aligned. Glue all of these pieces you have to created together using pipe glue. Use a flat surface such as a table to ensure parallel joints. Once glued and attached to the bicycle, place PVC insulstion onto the PVC frame for extra padding and protection. Drill holes into the x2 outside pipes of the frame. You can use these holes to attach bungee cords onto the frame which will hold your surfboard in place. Place your surfboard on your new bicycle rack and test it out! Similar to the above video, this bicycle surf rack from RodndTube provides more detailed diagrams and drawings. 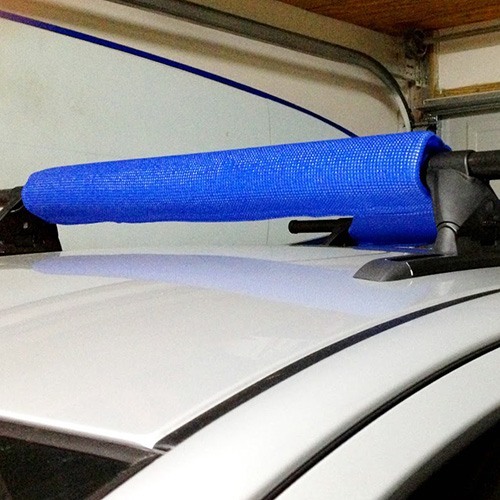 Not technically a rack in itself, we included this DIY rack pad because it is important for protecting your surfboards against dings when placed on racks or whilst you travel. These rack pads from Crafty Surf are built using velcro, stitching and insulation foam. If building your own surf rack seems like too much effort, then you can always check out our guide to buying surfboard wall racks.